Photo courtesy of ABC 23. A retrofitted shipping container is a new approach in hands-on science classes for local students. 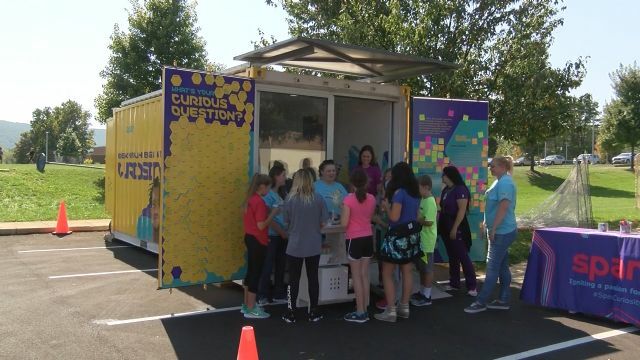 The Curiosity Cube is making stops in several Centre County schools this week. Inside the cube three separate learning stations. One is dedicated to DNA, another the Brain Station and the third is a 3d printer. "It's really about sparking curiosity within our future generation of scientists. So they learn multiple different subjects, but we wanted to bring science to them in a fun way." The Curiosity Cube has been touring the country since March so far close to 25 thousand students have visited the cube. Watch a video of the Curiosity Cube in action on ABC 23.